Rebel With A Dog, North Pole Series. Item No. 4035575. With here trusty St. Bernard in the sidecar, this motorcycle mama elf is off for an afternoon ride. Both wear helmets and googles. All Rights Reserved. Department 56 is a licensee of Harley-Davidson Motor Company. Materials: Porcelain. Measurements of Product: 2 in H x 1.75 in W x 2.75 in L. Retirement Month and Year: December 2014. A part of the North Pole Collection, designed by Department 56 - inspired by magic and charming legends. 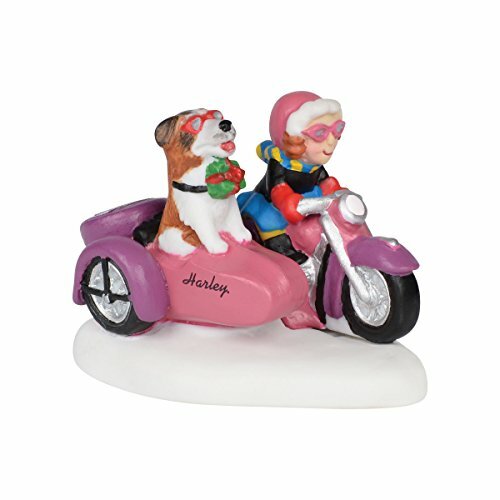 Rebel With A Dog, girl elf rides her Harley with a side-car companion. Hand-crafted & hand-painted porcelain accessory. With here trusty St. Bernard in the sidecar, this motorcycle mama elf is off for an afternoon ride. Both wear helmets and googles.